This one is a little bit unusual and special as I have managed to get an interview with the super talented Margaret Dier all before her fabulous new book is released, Thread painting and silk shading techniques. Released on the 7th November and containing a wealth of Margaret’s knowledge I can’t wait to get my hands on this book. 1.) 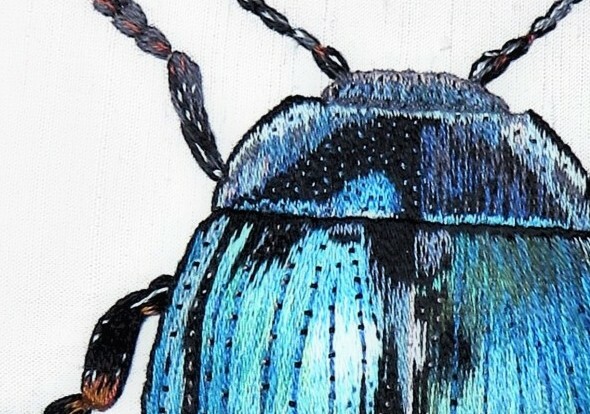 When did you start your career in embroidery? I started twenty-five years ago when I was accepted on to the Royal School of Needlework three year apprenticeship. 2.) What made you choose embroidery as a career? 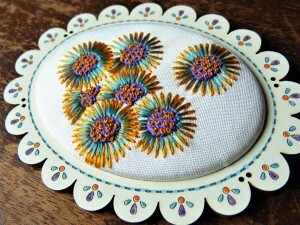 I have always loved embroidery and was always stitching as a child. It was only when I saw an article about the Royal School of Needlework in a magazine that I realized I could embroider for a living. To get a chance to learn about so many other embroidery techniques and then get to work on amazing historical artifacts seemed like such an opportunity. 3.) What is your favourite piece of embroidery you have ever done? Hard to choose a favourite! 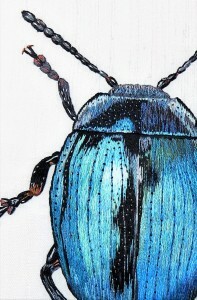 Before I wrote my book I would have to say my turquoise beetle. I stitched it purely for pleasure, turquoise being my favourite colour and the challenge of making a flat embroidery shine and seem like it is coming out from the fabric. Since writing my book I would say my Highgate Cemetery angel statue. This was a challenge in another way as I left spaces in my embroidery so the background fabric showed through to give a mossy effect to the stonework. I loved the effect so I included this technique style in my instruction book. 4.) Silk shading has become your speciality, why do you love it so much? 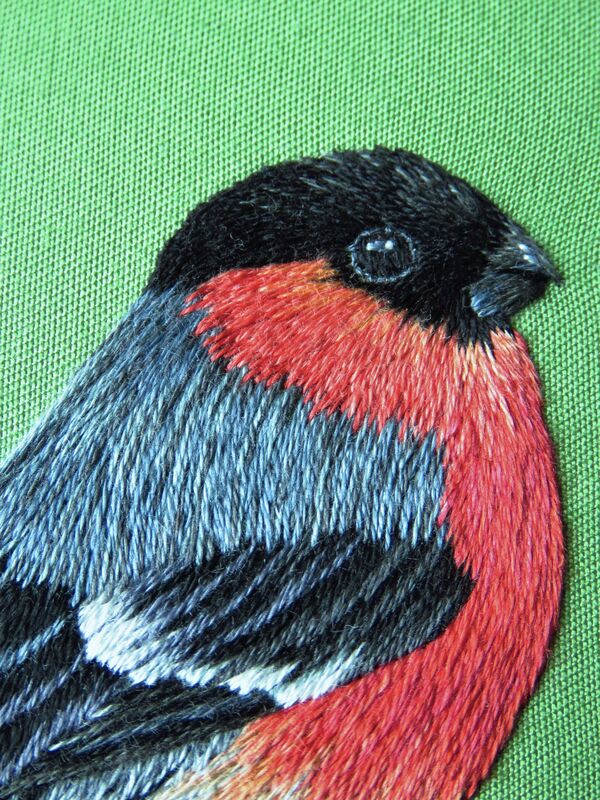 I love the freedom of blending colours and trying to recreate nature in embroidery stitches. 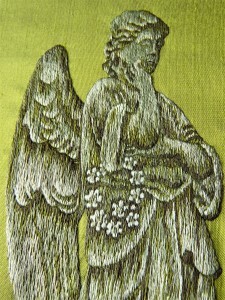 I love the effect it has of looking like a painting, people cannot quite believe it is embroidery! 5.) For those that know nothing about silk shading could you briefly describe the technique? It basically starts with a stitch called long and short. The stitches are worked in rows interlocking with each other, changing angles where necessary and using many different colours to create a natural effect. Many needles can be on the go at any one time, all threaded with different colours. 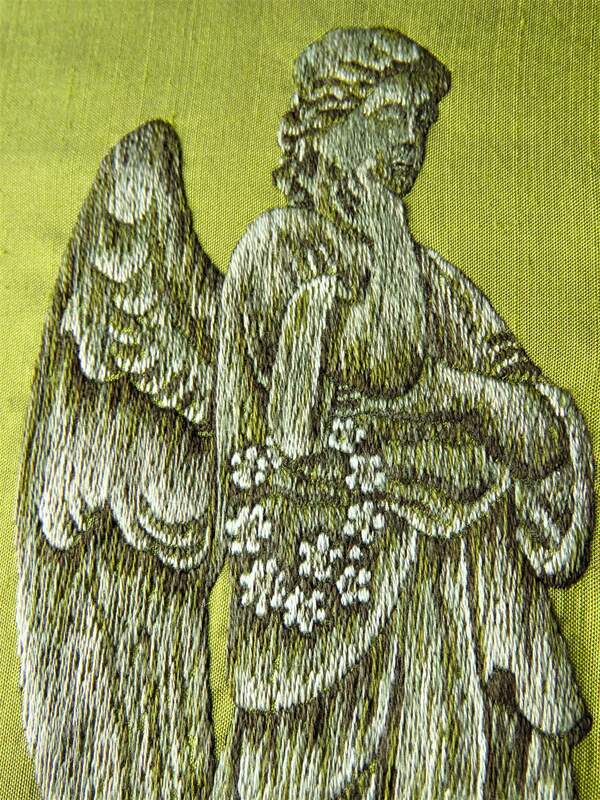 It can be worked in wool, cotton and silk threads to great effect. for styles and techniques but I had to draw the line somewhere and kept to twenty projects. 7.) Who is the book aimed at and what could they achieve from it? The book is aimed at total novices in embroidery and more experienced stitchers. All the basics are covered from thread types and preparing your design and frame. Then there are projects from a simple feather design to more advanced three-dimensional hydrangea flowers. There are templates in the back for people to use for the projects and step by step photographs to follow the projects through easily. I have also included historical and cultural thread painting techniques to hopefully introduce the more experienced stitchers to other ways of working they may not have been aware of. 8.) Silk shading is a tricky technique to master, what are your best three tips to help people succeed? Well I don’t know about you but I am certainly feeling inspired and I can’t wait for Margaret’s book to be in my hands. I am so lucky to have been taught by this amazing woman. Margaret also creates beautiful embroidered jewellery which is available to buy in her Etsy store. I hope you enjoyed this post and feel free to add your comments below. All images are copyright to Margaret Dier 2018. Thank you Sara for writing this interview. You and Marg are wonderful teachers! !